A great first half-hour and wonderfully fresh take on the classic becomes pretty silly pretty quickly once pan gets to neverland. Hook started out so good! And that level of excellence lasted for a full thirty minutes. The movie used its first half hour to setup a premise about a man who used to be Peter pan, in what felt like another lifetime ago. Now, he was just a lawyer, named Peter Banning (Robin Williams.) he lived in a nice house with an English wife and two kids, and had no memory at all of ever being Peter Pan. The movie was about him going back to Neverland, and remembering. At the start of the film, Banning and his family are watching a play of Peter Pan. His daughter is performing in it, and he sits in the audience, watching and taking a business phone call. Banning is a heavy in the world of law, and can’t be pulled away from his phone or meetings. He misses his son’s baseball game, which he promised he would be at, and has duel over who can draw their phone first, with friends at work. The whole, dad who isn’t there, might be a little clichéd, but Williams handles it well, not going for silly humor, but trying to play it for real. When the family flies to England for a benefit hosted by an old woman who runs an orphanage, things start to get great. It’s the second act of the movie, and suddenly we are getting a lot closer to the world of Peter Pan while still staying in the real world of plausibility and denial. The old woman is the one who found Peter, took him into the orphanage, and then found him a home. She is also the grandmother of Peter’s wife, and the original Wendy darling. She’s the one who the famous character of Wendy was written about. When the woman is on top of the stairs, hidden by shadows, and sees Peter returning for the first time, she says, “hello, boy.” the same line she says when seeing him for the first time in the classic pan story. It’s a pretty cool moment. So is the one where she tells him, “don’t you know who you are?” and flips to a page of a book with the boy Peter Pan dressed all in green with spunky red hair. The music in these moments, written by the great john Williams, swells up so perfectly, that it captures every emotion one could possibly have and hold them in place. Peter goes to the benefit, and when he gets back, his kids are gone. There are slashing marks all over the walls, and a note attached to a door by a sword that is signed by Captain Hook. Peter stands in the bedroom of his children, looking out the open window, trying to make sense of things, and that’s when Tinker Bell flies in. she’s played by Julia Roberts, and she and Peter wrestle around a little until she ends up in a dollhouse. She has fun with him and the idea that fairies die when someone says, “I don’t believe in fairies,” and before you know it, she’s carrying him off to Neverland. From this point on, the movie drops down a notch. Whereas it started out as an adult movie of how to tell this story with creativity and bring it into the real world, it now is becoming more and more of a movie for kids. Banning is dressed as a pirate when he awakes, and walks around imitating pirates, yelling, and “arr.” he even gets into a brief conversation. “Arrr to you too,” with another pirate. It’s silly and stupid. 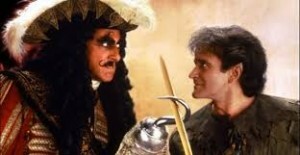 We meet Captain Hook, played by Dustin Hoffman, who does his best with the role. Luckily it’s not written to be too silly, but it still doesn’t quite work. Maybe that’s because the extent of Hook’s evil is to turn the son against his father and make him like hook even more than he likes his own dad. Actually being nice to the kid, and winning his affection, doesn’t sound like the most evil character. There are some scenes that work great here, most notably the ones that involve the lost boys. One in particular, has a little boy examine Peter’s face and stumble on some remnants of pan. “There you are, Peter.” he says, in what is the cutest moment of the film. There are some more cool lost boy scenes too, involving shouting insults and throwing imaginary food. But as soon as the story moves away from the lost boys camp, it takes a turn for the worst. 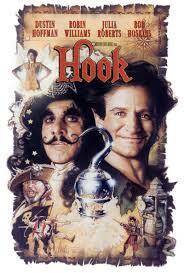 Hook and all of his associates, including Bob Hoskins playing Smee, are a mess. They aren’t scary or threatening. They even play a big baseball game. How silly is that? The movie starts to drag on quite a bit in it’s second half. We watch a flash back scene of when pan first showed up at Wendy’s house and chased around his shadow that is completely unnecessary. Just like the baseball game scene. I understand the reasons for it; the baseball game is meant to parallel the one that Banning missed of his son’s. It’s meant to show that Hook is trying to be a better father. But we don’t need it. We got a great scene of Jack (the son), destroying clocks to take out his anger on his dad, and that was enough. It’s as if the movie gets lazy the longer it goes on. Or maybe we run out of patience for it. Everything seems to be handled poorly. Yes, it’s cool what happens to the fate of one of the main good guys, but otherwise, we are given nothing to work with. The huge crocodile looks beyond fake, and is it supposed to be alive or dead at the end? It’s jaws never even move, not even to snap shut. Steven Spielberg directed the movie, and it’s probably the first Spielberg movie I ever saw that I knew was he, (when I saw movies like eat. as a child, I’m sure the name Steven Spielberg meant nothing to me.) but this movie got me started on who the man was, a director for the mainstream who sprinkled his movies with a coating that made them just right for children. A guy who got to work with the greats (Williams, Roberts, Hoffman), and remake a classic fantasy, just because he wanted to. I liked his take on the tale with this movie, but wish he maintained the same level of creativity throughout the film that he had in the first half. Unfortunately, once the silly button in him got pressed, there was no turning it off. What could have been a great film, and started out as a great film, ended up being just okay.